It often ends up that what should be the smallest and simplest improvements end up as the biggest battles and that’s proving true again in Mt Eden. Last month, Auckland Transport consulted on a number of changes to bus infrastructure on Mt Eden Rd to make buses work better. Early indications are that they were widely supported by those that submitted. However, one of those, extending the bus stops in the Mt Eden village so that multiple buses can stop at once without blocking the intersections with Stokes Rd and Essex Rd intersection, is turning into a battleground thanks to the local business association hating buses and bus users. The key issue is that AT plan to remove six carparks, three on each side, to allow for these changes. In recent days there have been multiple articles and radio pieces covering the issue. Business owners are up in arms over plans to extend bus stops, which they believe would contribute to parking woes, pollution and noise. Auckland Transport (AT) has proposed to lengthen two bus stops in Mt Eden village, which are used by around 500 buses a day. Mt Eden Business Association said in a statement the proposal posed a “grave” threat to businesses and would “effectively turn the heritage shopping and dining precinct into one long bus terminal”. The suggestion of turning the area into a bus terminal is just one of many untruths and embellishments the business association have been peddling. Before going into some of the association’s claims, it’s worth highlighting this tweet from Auckland Transport who say that based on HOP data, 1800 people a day are using the buses from these stops. The association have claimed that only about 30% of people shop if they’ve using PT. Initially that sounds low but based on the 1800 per day, it indicates about 540 people daily. The noise resulted in a public meeting a few nights ago. Twitter user, and usually a parody account, Reg, attended the meeting and the list of the associations claims. Will reduce the accessibility and walkability within the commercial area rather than increase it – The changes make no difference to the footpaths. If anything, especially in the mornings the changes will make walking easier as there won’t be as many people queued up waiting for a bus (more on that later in the post). Longer term we’ll have electric buses plying this route. Perhaps the retailers could push for them to be introduced sooner. Will compromise the ability for heavy and over width traffic to pass the buses while stopped …. – This will be the situation regardless of what option is chosen. Elsewhere they’ve complained that Auckland Transport are “getting a free ride” because they can use the shelters outside shops rather than provide their own. You’d think retailers would want 1,800 potential customers every day. Still, I am impressed though that they managed to say it all with a straight face given all the freely provided parking AT and its predecessors have given them. Reg also attended the community meeting that was held. Here’s his/her tweet report of it. In addition, Kent decided to ride the Mt Eden bus earlier in the week to look at the experience. Helpfully he got the prime window seat to document it from. And here we see the issue with blocked footpaths mentioned earlier. All up the 6km trip takes about an hour. (Including wait, walk). How many more people would catch these buses if they weren’t also being caught up in the congestion. The changes AT have proposed will definitely help with that but if anything don’t go far enough and extend the lanes through the centre. AT has proposed to increase the length of two bus stops on Mt Eden Road. These bus stops have been there since the early 1950s. Extending these bus stops would allow for two buses to stop at a time, whereas currently only one can stop and this can cause buses to bunch up and block the traffic, this also creates safety issues for pedestrians crossing the road. If this proposal goes ahead, AT will need to remove six parking spaces, three on each side of Mt Eden Road. At the same time we are proposing to increase the amount of short-term parking in the area. This will mean there is far more p60 parking, allowing for more people to stay long enough to do their shopping in the village. By reducing the amount of all-day parking more people can come to the village and find parking close by. Each day around 500 buses use these stops and around 1800 people get on and off the bus in Mt Eden village. The proposed changes do not change bus routes or bus schedules, they would in fact make it easier for buses to stop, let people off and let people on then get back on their route. This location is less safe for pedestrians. It is further away from safe pedestrian crossing facilities, and bus users are likely to be tempted to cross the road where there is no crossing. There are fewer people around compared to outside the shops, particularly after dark and therefore some passengers may not feel as safe using these stops. The steep gradient would make it more difficult for mobility impaired users to get on and off a bus. It isn’t possible to provide protection from the weather for the entire walk between bus stops north of Valley Road and the village. The footpath is relatively narrow (less than 3m wide), and installing bus shelters would result in the remaining footpath being very narrow. This position requires significant additional infrastructure to be constructed which would have a significant visual impact on adjacent properties. Moving the bus stops to this position would result in the removal of 16 parking spaces. If the feedback from submissions has been overwhelmingly positive, like has been suggested, then let’s hope that AT get the changes implemented. Lisa Prager has a lot to answer for in stirring up meaningless fury at progress to make Auckland a better place to live. This is because most PT advocates and urbanists have no idea how to combat the Bright/Prager brand of deliberately fallacious, emotional appeals to the wealthy and privileged’s demand to keep everything just how it is. The biggest mistake is to try to “debate” her. A Prager crowd is like a Trump crowd; they don’t care about facts, they just want to hear what they want to hear which gives them that anger-buzz. If she is threatening to get on a bulldozer to stop the work, send her a letter reminding her that she would be breaking the law and will be taken to court for any costs incurred by stoppages. She’s ignoring about 50k of court and rates bills at the moment, so she’d love that. Yet another way she can show how authorities are persecuting her for her righteous fight. Bright owes; does Prager too? If that is true, she actually needs to be charged and convicted. Should she have done it at 2am instead Sailorboy? For heaven’s sake. Listening to this woman at a meeting makes anyone feel threatened, and quite frankly, abused at her lack of respect for others’ views and rights to speak. Knowing she had a crowbar and sledgehammer in her hand!! !… no wonder I’ve been hearing so many previously engaged members of the community are now hiding because they are afraid of the conflict. Sailor Boy – Been arrested according to stuff: https://www.stuff.co.nz/auckland/local-news/central-leader/102298217/anticycleway-protester-arrested-after-destroying-traffic-island-with-sledgehammer. I heard one person who saw her during her bike rants compare it to an American radical evangelical’s meeting, including rousing the faithful and casting out the demons and unbelievers (i.e. anyone who dared to say something contradicting her). Big Oil and other entrenched corporate interests love people like Lisa Prager who work hard to keep their business as usual money hoses flowing. They don’t have to do any work, pay anyone or get any nasty PR, they just sit back and laugh their way to the bank. Lisa thinks she’s an activist and calls anyone who disagrees with her a corporate shill. What’s worse than a corporate shill? An unpaid tool for Big Oil and the corporate elite, not to mention all the little local interests that keep her at arms length while using her to advance their own agendas. That’s what Lisa is, an unpaid tool. They’re playing you for a sucker, Lisa. +1 – I say we send her to Australia – she is obviously here only to cause disruption to real Aucklanders. Thanks Matt, Reginald, Kent and Cam. AT will make more progress with straight-forward improvements like this, I think, if they run a city-wide education campaign. Individuals empowered with information are far more likely to stand up and defend each progressive project against the people who just don’t want to change. +1. All school children should be issued with a goldcard equivalent at school. Nobody can persuade adults like an enthusiastic kid. At present if you are travelling in Auckland with a couple of kids it is often much cheaper and easier to jump in a car. Lets remove the ‘cheaper’. Except that if kids are present we’d need to model good behaviour. Perhaps a rule that no-one is allowed to shout over the top of other people, especially not for long periods of time. And especially not when the subject they are shouting about isn’t even the topic of the meeting. I wonder if these town hall meetings tend to attract a minority demographic, mainly those easily able to get out at that time or who have strong views one way or another. People with young families, kids, shift workers and people who don’t live nearby are often excluded. I think getting kids’ opinions at school is a great idea to balance this out. Yes, even evening meetings about transport held at school and inviting parents of the school brings out more interested parents than public or community organisation meetings do. A less obvious factor for why this happens is that sometimes the children need to come along – even if they’re not interested – and both parents and children are more comfortable with the arrangement if they know the school environment. And yes, I think meetings for the kids is a great way forward. AT is already going into schools with great programmes to teach them about specific routes and how to cycle safely to the school. Perhaps the public transport divisions need to have a school focus too. Does anyone have any stats on whether the weekend rates for kids has had much effect? 99c (or I guess $1.98 for a 2 way journey) per kid isn’t that expensive. Yes it would be good to know. Note that 99 cents is only for a two-way journey within a four-hour period. This would cut out the second leg of many weekend outings. Yet this fact is little known, so there will be a negative PR effect for those then charged for the return journey. I cannot see the point of the four hour limit, personally. The weekend fares help but not enough. Most families would still have to drive on the basis of cost, if they already own a car. Have you ever tried to park on Mt Eden Rd in the village, impossible comes to mind. They need to improve the traffic flow through the village and these bus stop extensions will be a step towards that. Is the Mt Eden shops still the end of the first fare zone? When I lived there is 1986 that was the reason the bus stop was so busy. Everyone walked there to avoid paying for two stages. We lived in a flat beside the next bus stop to the south but we never used that bus stop, I don’t think I ever saw anyone use that bus stop. If they haven’t fixed the fare stages yet then that would be a very easy improvement to make. Just include the next two stops to the south and suddenly the stops at the shops wouldn’t matter so much. +1 The overlap bus stops that work in either zone are: Stop 8510 at 444 Mt Eden Rd and Stop 8513 at 415 Mt Eden Rd. So whether you’re further north and going south or further south and going north you’d walk to the village. If they moved the zone boundary to about Windmill Rd, this issue would be removed. It would also shift the Hide and Ride parkers further south. Very good point! Even better, get rid of fare zones entirely, treating the cause instead of managing the symptoms. Yes another perverse outcome of zone based systems. I’m for a distance based system even though fares bit harder to know without an app or such. Agree. The business owners might protest this though as many of the 540 people that currently use the bus and shop in the village would no longer shop there. Exactly but hey, that custom would go elsewhere. Maybe to businesses that want customers. 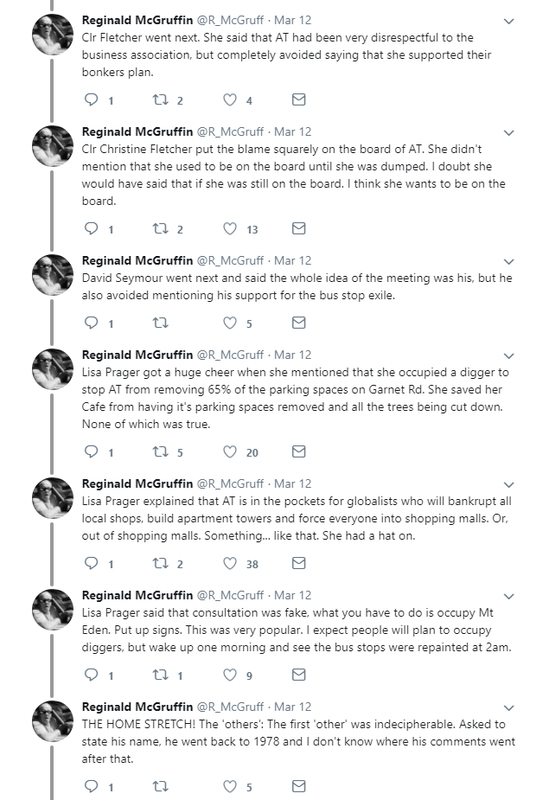 Lisa Prager = Penny Bright Mark II. I am pretty sure they will both tell you that chemtrails exist, we never landed on the moon and the earth is actually flat, despite what scientists tell you. Wish u told me things earlier. Also, if you question their motives, they will claim you are a paid person for AT. Never talk to them or give them air. Agenda 21 is their favourite. All part of the globalist conspiracy, apparently. You are headed way down the rabbit hole with that stuff. The Mt Eden Village facebook group are determined to get their own way by blocking anyone who comments with a logical reason that goes against their agenda. Logically it is better for business to have bus stops (and passenger patronage) closer to their businesses for instead of a few car parks that end up taking up most of the roadside and blocking the thoroughfare (and making the road much busier and less pleasant for everyone). As for Mt Eden being a “heritage shopping and dining precinct” they should consider advocating for trams to be reinstated. That was the last time there was anything remotely heritage about the village. I’m sorry Matt but I stopped reading when I came to “”thanks to the local business association hating buses and bus users”” in your 3rd sentence. Usually you write interesting, informative posts where you balance the pros and cons of transport issues and if you decide one side has the better arguments you say so. However no rational person can imagine anyone waking up in the morning with “I hate bus users” as their motivation. It is just about conceivable that there are still a few Marxists around who wake up with a “I hate businessmen” mantra. I have limited experience of Mt Eden but presumably like most of Auckland it is becoming congested and the solution to heavy congestion is buses so you ought to be able to frame a politely expressed argument that is persuasive knowing that in the long run you are bound to win. However if you start with the assumption of hatred you will not change minds but you may end up stirring up conflict. For the best example of how to butter up and flatter your opposition so they will give consideration to your side of an issue read Jim Flynn’s short book on climate change. Matt writes so much about such important issues, so frequently and so well. He puts in more time and energy than most of us can imagine. I’m surprised he isn’t blaspheming about issues like this one. I agree with all your comments about Matt. And I don’t mind a bit of give and take in the comments spicing things up. I just want the bus enthusiasts to realise they have to sell their argument not dismiss all opposition as a form of irrational hatred. Hi Matt, I moved from your post to the back page of the Herald and Mike Hoskins: I was wrong there is one person who does wake up hating bus users. Is it 900 people that get on and then later in the day get off? Or is it 1800 unique individuals? I wonder how many of those people get on/off in the morning/afternoon peak, as opposed to people coming to the village to eat/shop? I’m only interested because I think it would be interesting, it doesnt change my view on the bus stops. If AT want to allow two buses to stop instead of one then that’s fine by me. The Usual Suspect activists may well be annoying, but they are getting more tracking in Auckland right now than anyone supporting this change. AT needs help – from the public and activists who support public transport. Impressive to see a Councillor stand against her own CCO and her own transport strategy. This is one of thousands of fights that are about to occur if we want this city transformed. Time to gear up, just as the shopkeepers are. You might need to copy and paste, there. Only members of that neighbourly area can view it. The problems with relocating the Mt Eden Village bus stops as the local Business Association suggests can be rectified. Seats, shelters, lights and security (security guards?) can be provided at the relocated bus stops, and accessibility ensured by realigning the road. This will all certainly be expensive, but the Business Association will be only too happy to pay a special, targeted rate to save the six parking spaces they clearly value so highly. Time for the Mount Eden Village Business Association to put its money where its mouth is, and stop demanding that the ratepayers of the rest of Auckland subsidize their business activities and profits. Sadly they believe blocking the views to Maungawhau is a more pressing issue than the people who support Mt Eden Village businesses traveling via bus. Exactly. If you want to have exclusive rights to public land, you need to pay for it. How do you propose to rectify the problem of hundreds of pedestrians needing to cross an uncrontrolled side street from either of the relocated bus stops to reach the village shops, as per the business group’s plan? Or to cross Mt Eden Rd at that point? Suitably located pedestrian crossings, controlled by traffic lights, if necessary. This will certainly impede road traffic. So what? It is time to stop pandering to cars and those who insist on driving them everywhere. It is time to remove cars from the head of the queue for transport resources and put them at the end of the queue, where they belong. By moving pedestrians out of the village so a few more cars can park in the village instead? That’s business logic for you. No wonder the economy is a mess. I do think the Business owners have one good point – the buses are loud and stinky. Maybe they could have some kind of hybrid where it switches to electric mode when in town / city centres. On that criteria they should also ban all trucks for fumes, and all motorbikes for noise. Yes but the buses are parked right outside their shop, the trucks and motorbikes are a lane over, there is a big difference in both fumes and noise. Mind you, imagine the fumes from the extended “peak hour” of backed up traffic there would be if we didn’t have the buses and everyone was having to drive. I’m thinking the buses will get through and move out of the way quicker given bus lanes right through. Not sure what will happen with the cars as a result, probably flow smoother too so will be better overall regarding fumes & noise? Is there still some old single decker clunkers on this route, once we have new network central going shouldn’t have this issue if it is one. oh looked up the plans properly, it’s extending bus stops & the clearway time is extended 1hr, probably same effect though, buses won’t double park etc. Get some electric double deckers (like Wellington is). What amazed me is that people choose to queue for hours like this on Mt Eden Road – why not think of alternative routes or modes? I am far too much of a fidgety person to stand that sort of thing. Frankly I cycle and bus everywhere, especially business meetings. I am usually the only one who arrives on time. No, they really are that stupid. They have had their opportunity to submit. They have no greater right to say what happens on publicly owned and funded roads than anyone else in Auckland. But if we use Original Meaning that it doesn’t matter a damn what Joshua Arbury intended. So should we ask: What would a rational person living at the time the blog was created have believed should happen when NIMBYs unable to see why they should give up any rights harness the combined energy of tree-hugging greenies, business interests, vote-seeking politicians, climate change deniers and those wanting separation from the great unwashed? Angry shouting of “Cars are freedom! Cars are prosperity! Cars are patriotic” intensifies in the background. Then a wild Mike Hosking drives past and throws a newspaper column at you. AT have already done that. Well we have the intellectual ability here to show with facts, logic and arguments to win them over. Just pushing them in a corner does not help. I agree we can do Bike lanes easier and cheaper than AT is doing. I made mention to BikeAK. Its called GreaterAuckland and doesnt need to become a hate group. Yep still alive. Pretty sure I’ve always said bus lanes are good. 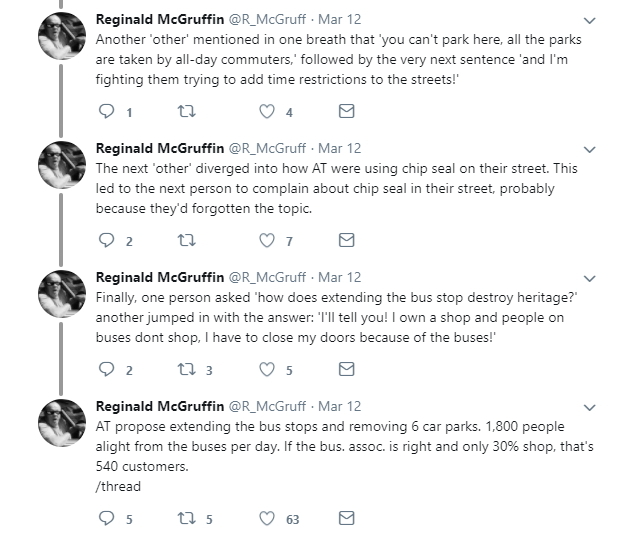 Bus users are members of the community, not some undesirable second-class citizen you segregate out of sight to the fringes because they smell bad. If so many people are still coming to shop there by car, even though it’s already really tough to find a parking spot, they aren’t going to stop because a couple of the most dangerous parks are lost. So the obvious message from that last pic is; don’t stand there helplessly with the crowd, waiting for your snail like bus, get on a scooter. AT just need to build this. The majority support it, the majority support bus lane hours extensions, it’s part of the strategies and policies for the whole region, it stacks up from an engineering perspective. Do it at 2am if you have to, just do it. Show these special interest groups that they don’t get to hijack democracy. These folks remind me of O’Connell and High Streets nimbys. 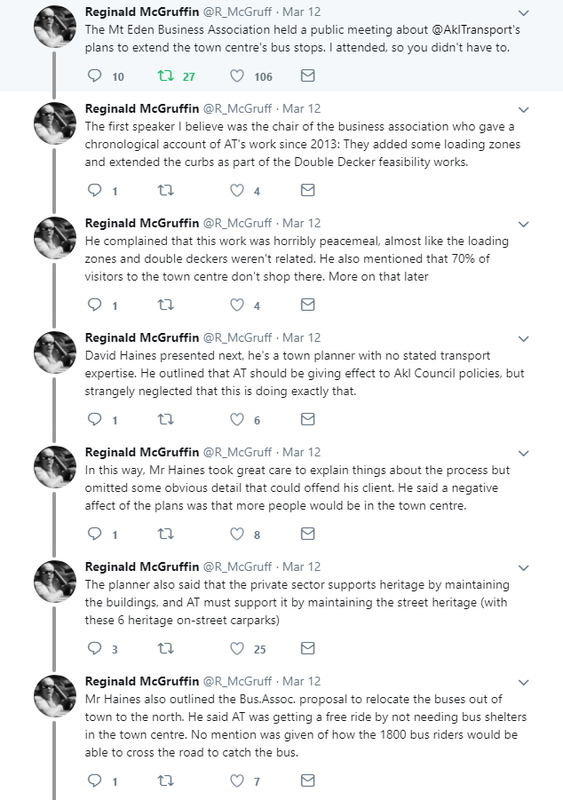 O’Connell was moaning that it would be the end of their businesses (ignoring empirical evidence just along the road), then moaned even more when the road would be car free during the construction of Freyburg Plc – Now they’re asking the council to make it car free full time! Mt Eden will be the same, lots of uninformed or misinformed whinging and threats, followed by grateful silence when things improve. I seriously doubt that any of them will be big enough to ever admit they were wrong. AT is not a democratic organisation that has a mandate to do anything it wants. You seem to be suggesting that opposing AT is some sort of subversive activity. They would need to have board elected by the people before they could ever claim that. I’m not suggesting that opposition is subversive, I’m suggesting that *this* opposition is vexatious and should be ignored. Vexatious. That, sir, is a damned fine word! OK I understand. You think they just want to annoy AT. Nothing to do with the fact that this is their neighbourhood and that they use this area daily and the love being here. Maybe you could explain why you think AT is allowed to be annoyed when people point out there might be a better way. AT are allowed to be annoyed at anything they want. They are allowed to *ignore* a tiny special interest group where the group disagrees with; a rational objective analysis, the strategy decided by them and by council with regional public input, and the majority of submitters. AT can and do ignore local people. But that is the very point, they shouldn’t. Traditional local centres exist because for generations the road space has been used in a way that supports the local centre rather than just using it as a means to move people through quickly. AT, since they began, haven’t made a very good partner to these centres. If their intention is to kill them off then they should come out and say that. If they want to work with communities then they need to learn that consultation requires listening. If you have ever had any dealings with AT as an outsider then you will know that is not how they operate. They hold meetings so they can tick a box. They will tell you they want to work with you and need time to investigate any alternatives put forward and then you find out later they just carried on at full speed with their original project. They employ project managers (some) who will simply lie. When I work for local groups now I tell them about my earlier experiences so they can be aware of the types they are dealing with. Now I tell people by all means submit and talk, but only a legal process will make AT take any notice at all. Luckily, extending the bus stops achieves this. Businesses want the road environment to support their businesses. Cool, that is reasonable input. Businesses want car parks retained because that will support their businesses. Not cool, it isn’t true. Consultation should ask what outcomes the community wants, not what the road layout should be. AT *has* to ignore some people, they should ignore the minority, going against the strategic plans, and against evidence. mfwic, did you not read Reginald’s twitter? “Nothing to do with the fact that this is their neighbourhood” Who was razzing them up? Golly gosh she has a lot of neighbourhoods. Not just West Lynn, but Quay St and Mt Eden too? The sooner AT is brought back under direct Council control the better. Answer – Make the Buses and bus stop look like trams. They’ll love it. As long it isn’t one of those ridiculous tacky fake tram style tourist buses they have all over the USA. Those things are not only uncomfortable, they are noisey, have low capacity and are a joke! If you mean the european style multi articulated tram-bus things then for sure. Prager seems to have an even more tenuous grasp on reality than Ms Bright. From the aforementioned rag: Prager believes transport and roading changes being made by AT are “designed to assist multinational corporations to transfer public money into private hands via confidential contracts”. Hmmm – Alternative transport lobby group? Really? What’s alternative about wanting better use of resources? Nope, Ms Bright broadcasts the same fevered imaginings at every opportunity. The lizard people are coming to take over the world, one carpark at a time. Break out the tinfoil. Its great there is always some looney tune that makes me laugh. How do you join agenda 21? Christine Fletcher is one of the councillors representing both the Eden-Albert Ward and the contiguous Puketapapa (Roskill) ward, through which the Mount Eden buses traverse. As a previous resident of Three Kings who used this bus route, and now as a resident of Eden Valley, I say shame on you Christine for not sticking up for your constituents in both wards who use public transport. The 27x buses are frequent but totally unpredictable in their journey times. I remember seeing three 277s turn up at my Three Kings outbound stop at the same time. Given the 277s were scheduled 10 mins apart, that represents are variation of 20 mins on a 45 min route – which is unacceptable (the route schedule’s a bit slower now with the double deckers). Multiple buses are simultaneously within Mt Eden village now FFS – they are just blocking traffic because they can’t fit into the stop. Surely a longer stop is going to make a better experience? It is never going to be a bus terminus, because they are all travelling on to Mount Roskill or the city. Occasionally I would get off at the village to buy some stuff on the way home from work, but it was always a gamble whether the next bus was 3 mins away or 20 mins away. If the predictability improves, then maybe more people will stop at the village and business will be better?? That’s right. Currently the buses on Mt Eden Rd bunch (no bus for 20 minutes then 10 buses turn up) which is inefficient. The extension to bus lanes will fix this issue. Let’s see how that goes. The claim that AT did not consult and did not listen, is nonsense. They did both and they went with the majority which happened to support the best option. Those claiming otherwise, including on this board, are just just a vocal minority stuck in the past and actually irate at the fact their minority view was not followed. It’s 3 car parks for 1 bus stop on each side…..grow up and move on.